One of the most prestigious addresses in Paris, this exquisite Paris apartment for rent is situated on the Quai de Bourbon,right on the western tip of the Ile Saint-Louis, overlooking the Seine. The apartment is in an impressive 17th century building, accessed through huge wrought-iron and glass doors into the elegant lobby. There is an elevator to take you to the 4th floor, then up a few stairs to reach the apartment, which occupies the entire floor. As you step into the vast living-dining room and look out of any of the windows, the views are absolutely breathtaking. All 88m2 of the apartment are generously bathed in a warm and natural light. There is a very tasteful mix of classicism and the contemporary that runs throughout the apartment. 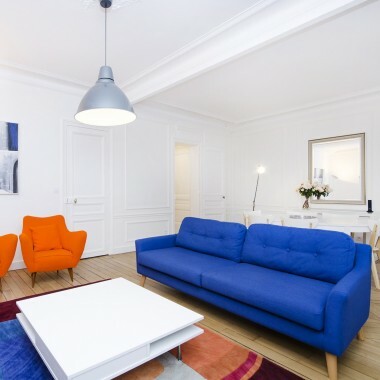 Polished wood floors, comfortable sofas and armchairs, carpets and best of all the splendid views of the Ile de la Cité and the Right Bank leading toward the Marais. The accommodation consists of a small foyer entrance hall and the vast living room, semi-divided into three different living areas: lounge, dining room and sitting room. There is also a spacious double bedroom and bathroom, as well as a sofa-bed in the living room for a third person staying. The lounge is comfortable with overstuffed armchairs, TV with all international channels with cable (CNN, BBC), DVD, stereo B & O CD player, private telephone. There is Wi-Fi internet and a box safe to store valuables. There is also a hairdryer and both laundry and ironing facilities. Entrance foyer. Vast living room, divided into sitting areas and a dining area. There is also a sofa-bed in the living area. Well equipped, modern, kitchen with glass table and chairs for breakfast. Kitchen equipment includes fridge, freezer, electric stove, oven, grill, microwave, coffee maker, electric kettle, toaster and dishwasher. A laundry and pantry off the kitchen also has a washing machine and dryer. Double bedroom with queen-size bed. Large marble bathroom (bathtub, shower over, basin and WC. Guest WC just off the kitchen. 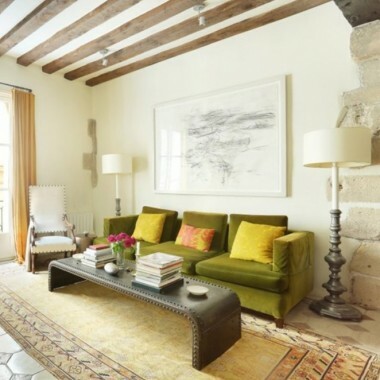 This exquisite apartment for rent is situated on the Quai de Bourbon,right on the western tip of the Ile Saint-Louis, overlooking the Seine. 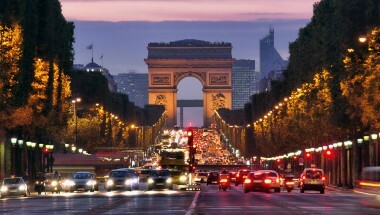 Here you are right in the centre of Paris and within easy walking distance of the Louvre, Pompidou Centre, Notre-Dame Cathedral, and the Latin and Marais quarters. 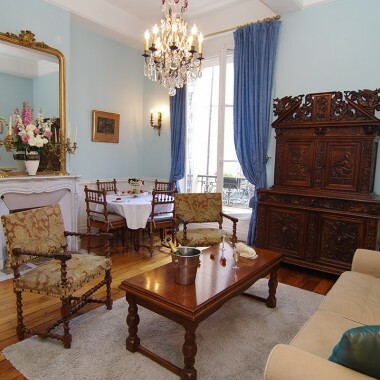 The apartment is in an impressive 17th century building, with lift to the 4th Floor.